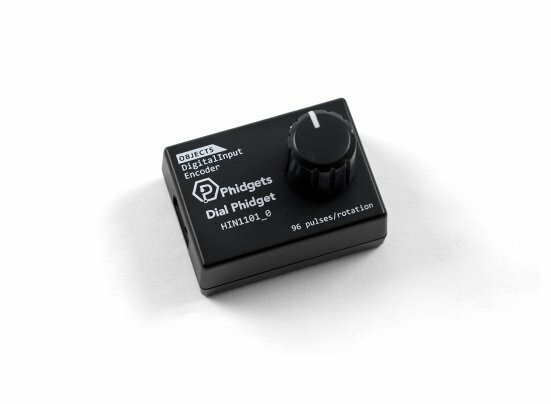 If you need a straightforward solution for a control knob on your project, the Dial Phidget is just what you need. 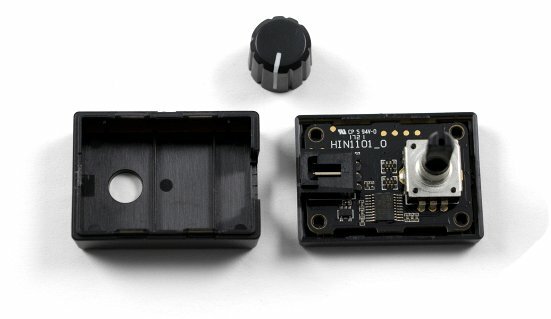 It uses an optical encoder, so it has fully continuous rotation with none of the dead zones or physical wear that potentiometer-based dials have. 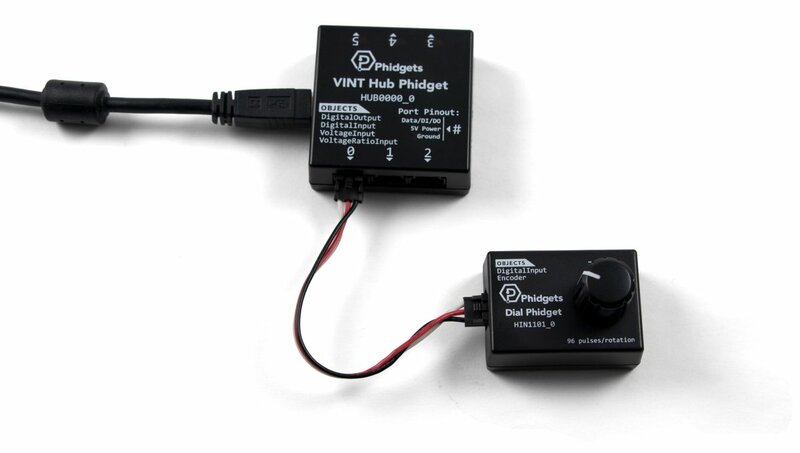 The HIN1101 connects to a port on a VINT Hub. See the Connection & Compatibility tab for a list of hubs. When the dial is pressed down, a DigitalInput object will change from false to true, so your program can use the change event to trigger a function or feature of your project. 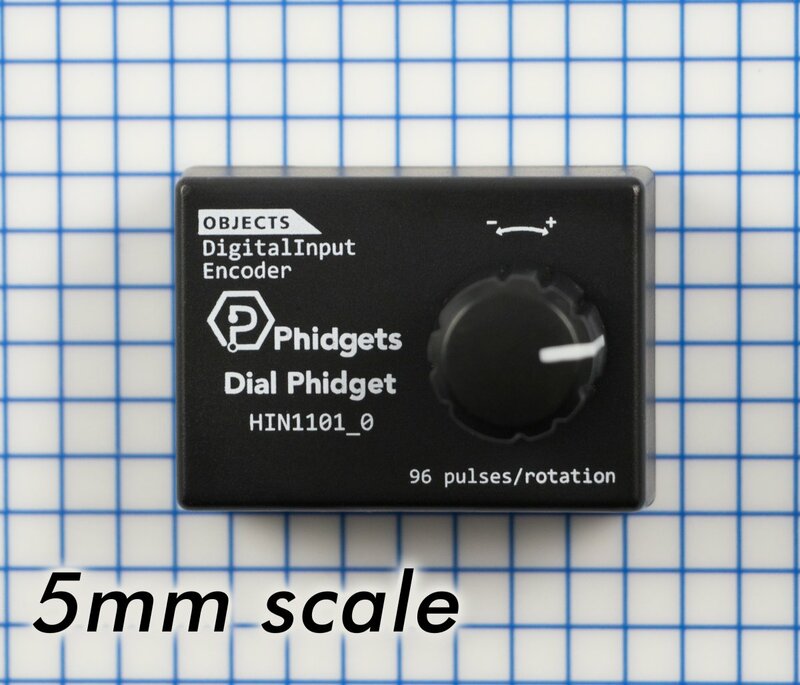 Connect the HIN1101 to the VINT Hub using the Phidget Cable. Now that you have everything together, let's start using the HIN1101! 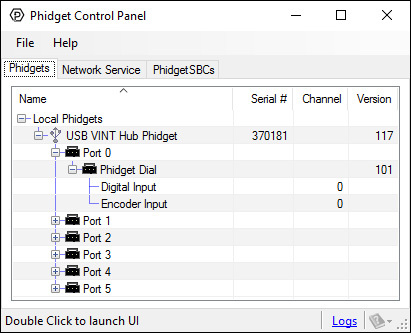 In order to demonstrate the functionality of the HIN1101, the Phidget Control Panel running on a Windows machine will be used. Linux users can follow the getting started with Linux guide and continue reading here for more information about the HIN1101. When you double click on an Encoder object, a window like the one pictured will open. 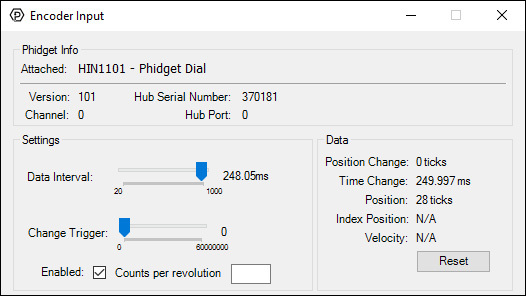 On the left, you can enable the input (if applicable) and specify the counts per revolution (CPR) to enable velocity calculation. Press enter after typing a number to enable velocity. You can also adjust the Data Interval and Change Trigger. Index Position: Not supported by this device. Velocity: If a CPR has been specified, the average velocity in rotations per minute. You can click down on the center of the dial in order to activate the digital input. Some of these dials have a limited range of rotation, but are otherwise potential alternatives to the HIN1101.